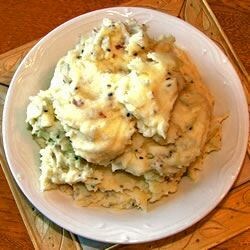 "These garlic mashed potatoes are rich and very tasty! For a creamier texture, use heavy cream in place of the milk. These are also terrific topped with green onions." Bring a large pot of water to boil; add potatoes, and boil until soft, about 20 to 25 minutes. Drain, and place in a large bowl. Combine potatoes with milk, butter, garlic, salt, and pepper. Mix with an electric mixer or potato masher to your desired consistency. Sprinkle with sesame seeds. Rich & creamy, my family loved these potatoes! I added sour cream and left out the sesame seeds. I also used minced garlic in a jar and it came out terrific! This is a keeper in our home. Thanks. I made these potatoes even creamier by substituting fat-free sour cream for the milk. They were heavenly. Use an electric mixer for best consistency. Delicious! Used half and half, margarine, and boiled potatoes with 4 cloves cut up garlic, then mashed it all together! YUM! Very good and very easy. I used half of the butter that the recipe called for and substituted fat-free sour cream for the other half. I will definetly make these again! !